Challenging the longstanding interpretation of the early English public sphere as polite, inclusive, and egalitarian this book re-interprets key texts by representative male authors from the period—Addison, Steele, Shaftesbury, and Richardson—as reactionary responses to the widely-consumed and surprisingly subversive work of women writers such as Mary Astell, Delarivier Manley, and Eliza Haywood, whose political and journalistic texts have up until now received little scholarly consideration. 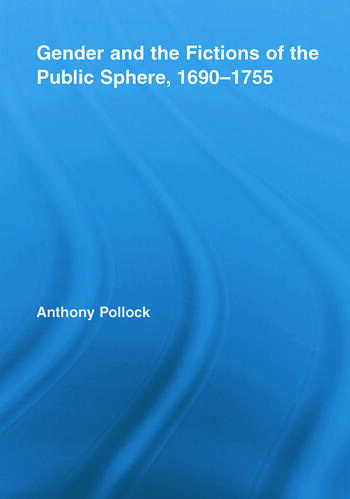 By analyzing a wide range of materials produced between the 1690s to the 1750s, Pollock exposes a literary marketplace characterized less by cool rational discourse and genial consensus than by vehement contestation and struggles for cultural authority, particularly in debates concerning the proper extent of women’s participation in English public life. Utilizing innovative methods of research and analysis the book reveals that even at its moment of inception, there was an immanent critique of the early liberal public sphere being articulated by women writers who were keenly aware of the hierarchies and techniques of exclusion that contradicted their culture’s oft-repeated appeals to the principles of equality and universality. Chapter One, "Learned Oracles, Muck-Spattered Spies, and Academic Activists: The Politics of English Publicness, 1690-1714"; Chapter Two, "Neutering Addison and Steele: Aesthetic Failure and the Spectatorial Public Sphere"; Chapter Three, "Gender, Ridicule, and the Satire of Liberal Reform: ‘Manley,’ Mandeville and the Female Tatler"; Chapter Four, "Astell, Whig Publicness, and the Problem of Female Specularity"; Chapter Five, "Richardson, Anti-Pamelism, and the Promise of Female Discursivity"; Chapter Six, "Voyeurism, Feminist Impartiality, and Cultural Authority: Haywood and the Addisonian Periodical." Anthony Pollock is Assistant Professor of English at the University of Illinois, Urbana-Champaign, where he specializes in eighteenth-century European literature and gender studies. A former Mellon Fellow at the Newberry Library, Pollock’s work has been placed in many journals, including ELH, Philological Quarterly, and The Eighteenth Century: Theory and Interpretation.